Recycling – Does it ACTUALLY Make a Difference? At some point, you may have enjoyed a cold beverage out of a can, finished it, and then wondered, “Does it actually matter if I recycle this or throw it in the garbage? Do my actions make a difference?” Ms. Whittick’s Grade 7 class from Windermere Elementary school found out first-hand that what you do with your can does matter and does make a difference – a huge difference! Students from Ms. Whittick’s class went to Cranbrook to tour the facilities that demonstrate what a difference an action makes. 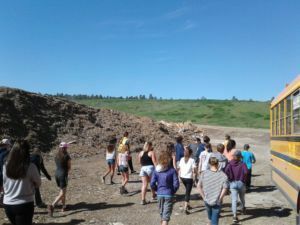 They first visited the Cranbrook landfill and were surprised to find out how much is actually diverted before it can be put into the landfill. Old shingles are crumbed into a material used to make the landfill’s roads, old metal scraps have been used to make the Canada Line skytrain in Vancouver, and wood waste is chipped and then used to generate power at the Skookumchuk Mill! The landfill is the last place you want your beverage container to end up as it’s literally a place where humans are filling the land with garbage. 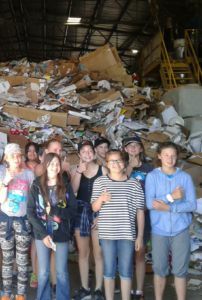 So, students next went to visit the Materials Recycling Facility, where all the large yellow recycling bins’ contents go to be sorted. 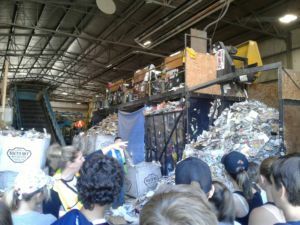 From all the mixed paper, cardboard, plastic, tin, and accidental garbage that comes out of the yellow recycling bins, students learned and saw first-hand how real people and machines sort and separate everything. 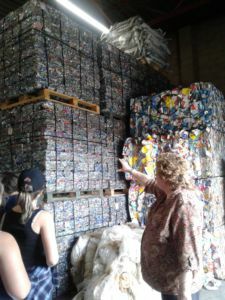 The sorting process allows the facility to package the materials into large, compact bundles to be sold, shipped away, and used to make other products (such as new magazines, plastic bottles etc – thus saving humans from having to cut down more trees or create more plastic from scratch). The pile of recycling in the below picture is just paper – all saved from the landfill! 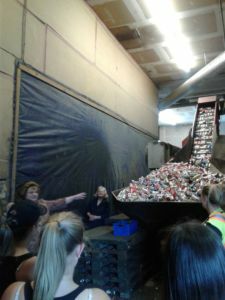 Lastly, getting back to that cold beverage, students went to visit the Kootenay’s main bottle recycling plant – where all the cans, bottles, and tetra packs that people decided to recycle (and not trash) from the East and West Kootenays are processed! With an enormous quantity of cans, bottles, and tetra packs coming through this facility every day, the facility put an extra shift of employees to work early in the morning before we arrived to make space for Ms. Whittick’s class! As the facility receives so much and only has a finite amount of space, they need to crush and compact the cans, plastic bottles, and tetra packs. The picture below shows hundreds of cans on their way to being compacted. Students were asked to notice the amount of space used by those cans now and compare it to the final product of the same quantity of cans. The cans are funnelled into a machine that crushes them into small cubes weighing 32 lbs (14 kg), and drastically reduces the amount of space taken up by the cans! Ask one of Ms. Whittick’s students how many cans are in one of the cubes – you’ll be amazed! Once the cans are crushed into cubes, the cubes are stacked together into massive piles, waiting to be shipped away and made into new cans! Thus if you drink a pop today, in two or three months the can you buy at the store could be made from the same can you initially drank from! That saved both a can from filling our earth (at the landfill), and more metal from being mined from the earth (to make a brand new can)! Thus do your actions actually make a difference? ABSOLUTELY!